As a human partaking in civilized society, there are certain pieces of information that you simply have to know, and critical documents you need to have at-the-ready at a moment’s notice. For example, I bet that right now you know what your social security number is and where your social security card is located. I bet you also know where your birth certificate is. If you have a passport, I bet you know where that is, too. Driver’s license? Deed to your house? Debit card? You can likely rattle off their locations without much thought. Not being able to quickly and conveniently locate any of the above when needed could create serious issues for you at critical junctures in your life. Likewise, for those of you who run websites, there are comparable pieces of information that you had better know, or have ready when needed. But my experience at Synthesis — where we provide managed hosting for WordPress websites — has taught me that too many site owners are far too lax with the most critical information about their websites. And, selfishly, if you’re a Synthesis customer now or planning to become one in the future, it’ll make our lives easier too … especially if you choose to take advantage of our full-service migration offering. You will definitely need to know who your DNS provider is and how to log into your account. You may need to know who your domain registrar is, what your current nameservers are, and your MX records. You need to know a WordPress user and password combination that provides administrator access to your site. You may also need FTP information for your old server, depending on how you are transferring the files to the new server. It should take all of about five minutes to locate all of this information. Surprisingly, it often takes people far longer. Issue #1: What do I need to know? One issue is that people don’t even realize what’s “must-have” information about their website. Website owners should be thinking about their domain registrar information like their birth certificate; their DNS information like their social security numbers; and their content management system login information like their driver’s license. You’d freak out if you couldn’t locate your birth certificate, social security card, or driver’s license. Maybe it’s time you start doing the same if you can’t immediately pull up this vital information about your website(s). Issue #2: Wait, don’t they know that? Another issue is passing the buck. Perhaps you have a website for your business, but you hired a developer to build it for you and you have a managed host to help you take care of back end issues. Great! If building websites and hosting them are not your core competencies, then you’ve outsourced effectively. However, the ultimate responsibility for knowing your website’s most vital information is yours, not theirs. A good developer or managed host will probably take care of you by having some or all of this information on hand, but … you should too. You are practicing irresponsible website ownership if you don’t. Registrar + the username and password to login. DNS provider + the username and password to login. And rather than writing it all haphazardly on Post-It notes or slapping it all into a random Word Document, keep it all neat, organized, and in one place with the WordPress Website Owner’s Emergency Checklist (PDF) that we’ve created for you. Just fill it out, print it, and tuck it away where you keep your important records. Do it for every single one of your websites. The PDF will not allow you to save it. This is not a deficiency of the PDF. We designed it this way for security, because we are always hyper-focused on security. If you save the completed form on your website, and your laptop gets stolen, guess what? The nefarious thief now has all of your critical website information. Not good. Go old school with this. Print it out blank and write everything in by hand. Or you can type in the gray boxes and then print it. Once it’s printed, tuck it away in a folder that is located in a safe place. While you’re at it, print two copies and keep one offsite. Your house probably isn’t going to burn down any time soon, but such things do occasionally happen. Bam. Now you have your essential site information secured and ready when needed. Critical mission accomplished. Don’t feel bad if you don’t have all of this information in one place right now. You’re not alone. Many of your website-owning colleagues don’t either. But you should feel bad if you read this post, realize you don’t know some or all of this information, and then do nothing. Because someday you’re going to need this information, and need it quickly. Who knows, it may even be during your migration to Synthesis. This is a really nice checklist, my hosting account just got hacked and I am moving all my wordpress sites to a new hosting account and I think this checklist will be very helpful, I have downloaded it thank you. And I’m glad you find the checklist helpful. It’s a simple thing but it can pay such huge dividends down the road. One of my websites got hacked a month ago also. This checklist is a must for that very reason! When you get hacked you need to change everything and having a record kept offline is probably the safest. This is so simple, yet so brilliant. 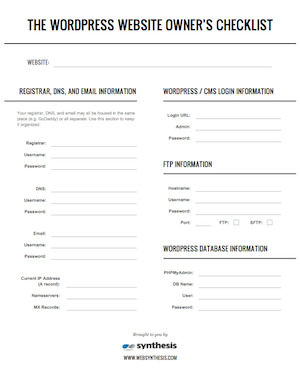 It would also be great if web peeps would use this and provide it to their clients… all filled out. I cannot tell you how many hours are often wasted looking for and tracking down this stuff with new clients. Cheers and thanks for the doc!! Thanks Bob! I’m hoping everyone looks at it like you do and sees how useful this can be. And it *should* only take a few minutes to fill out, but it can save so much time in the future. Can I third and carry the motion? This is not only brilliant, but I am a huge fan of anything that is organized and simplistic, not just for myself, but also for my clients. A colossal kudos Jerod, this made my morning a bit brighter. Well, you reciprocated, because your comment made my morning brighter as well. It’s great to see so many people immediately noticing the value of the checklist and putting it to use. That was the idea! I couldn’t have said it better, Tony. That would have been a great title! Very well said Tony. Tony, spot on. I’ve seen migrations delayed by 60 days due not having this information. When it really gets ugly, I’ve seen business owners having to contact ex-partners to get releases so that accounts can be reset, etc. Not having critical information can definitely cost time and money. This is a fantastic idea — I’ll be adding something like this to every client’s documentation. Thanks for sharing! Thank you Amy! Glad you’ve found it helpful. I knew if I prayed long enough, someone would create this for me. This one’s a mind blowing resource. Downloaded for future use, I wish I don’t have to though. Thanks for sharing! What’s mind blowing is how many folks unfortunately do not have this info at the ready when it’s needed. It’s our hope that spreading this sheet around will fix a bit of that. Excellent timing. I was just doing this as my second task of the evening and this was the second email I opened Voila! Guess what I will be doing tomorrow morning! Amazing material I would say. Thanks for sharing! I love the idea. I absolutely love the idea. Cheers! You are tops Jerod and thanks for saving me with such nice and informative checklist! WordPress sites serves the best for me and with it, I have hope my this checklist will be very helpful, thank you! Well thanks Rickie. Glad you find it valuable! Thanks for this! And if you write down important website information like this, then why not other things like Google Analytics info and the like? Not sure how I’m meant to write my nameservers on only one line though. Well, you’re supposed to write really, really small of course. 🙂 That’s not a bad suggestion though. Perhaps we’ll redesign it in the future. And yes, keeping ALL account information recorded is important. We wanted to keep this to a one-pager and include just the truly essential stuff. But you can’t ever go wrong being meticulous about account records. Wow! This is so helpful. Thanks brother! HI Jeroid! Excellent post and really love reading the post and I must appreciate your effort to elaborate to define all the major points simply and also provided the checklist. You’re welcome! The goal of the post was simply to sell the importance of the checklist. Hopefully I accomplished that! Nice post, Jerod. Absolutely loved it. That´s amazing.I am downloading right now. Great use of a Conan gif to complement a post. Great post, too. I usually backup my site manually which is time worthy and embarrassing to do. Thanks for the suggestions though. thank you for this… it took me some time to get together but i’m really glad i did.